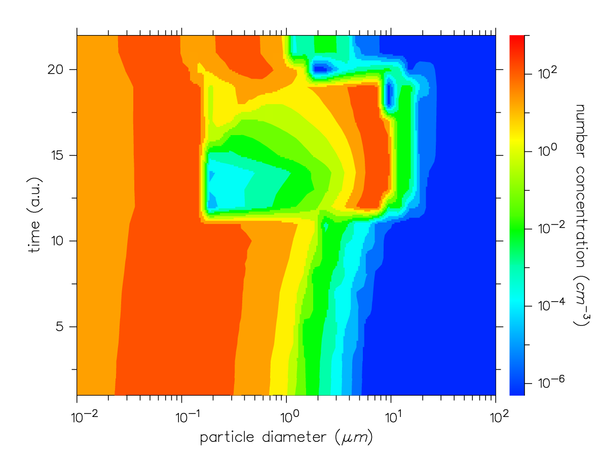 The aerosol, drop, and ice particle size/mass spectra are divided into fixed bins. Prognostic fields are the number, water and aerosol mass mixing ratio. The various microphysical processes such as drop/ice nucleation, condensation/deposition, collision and break-up are calculated explicitly whenever possible. The Linear Discrete Method (LDM) is used to map the microphysical fields to the fixed mass grid. SPECS can be applied within different dynamical frameworks. So far, most of the applications are within parcel models (constant updraft velocity, convectively driven, trajectory provided by orography or 3D models, based on updraft measurements, ...). Additionally, the coupled model system COSMO-SPECS was developed to investigate the dynamical feedbacks of a changed microphysics evolution, e.g. due to different initial aerosol particle distributions (see aerosol cloud interactions). Time evolution of aerosol/drop number size distribution during a mountain passage modeled with SPECS.